Our beloved K-9 Max and local agents have seized $1M worth heroin on I-74 disrupting distribution from Chicago. Officer Joe, Max’s handler, says that Max found 3 kilos of heroin. The car had already been checked by another dog and the officer put him on duty the second time and he made the find. 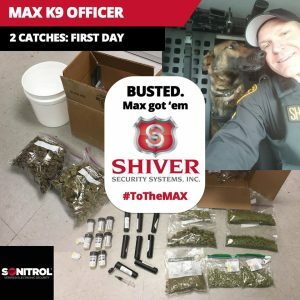 This comes just one week after Max also busted 70+ pounds of marijuana. Meet Max. We like to think of Max as our puppy here at Shiver Security Systems. We had long been seeking a way to support our law enforcement community by donating an additional K-9 officer. 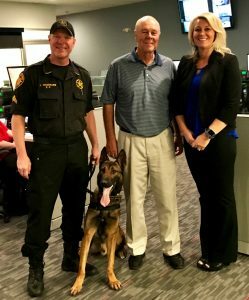 We are very excited to have partnered with The Matt Haverkamp Foundation to bring Max to the Hamilton County Sheriff’s Department. Shiver Security; where we take security #ToTheMax.